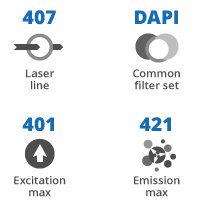 PB dye (Pacific Blue™) is a bright, blue-fluorescent dye optimally excited by the 405 nm line of the violet laser and with excitation/emission at 410/455 nm. The excitation and emission spectrum of PB dye offers minimal overlap with green fluorophore emission spectra, making it an ideal choice for the first violet channel. Conjugates of this dye are strongly fluorescent even at neutral pH. PB NHS Ester is structurally identical to Pacific Blue™ Succinimidyl Ester sold by ThermoFisher Scientific. 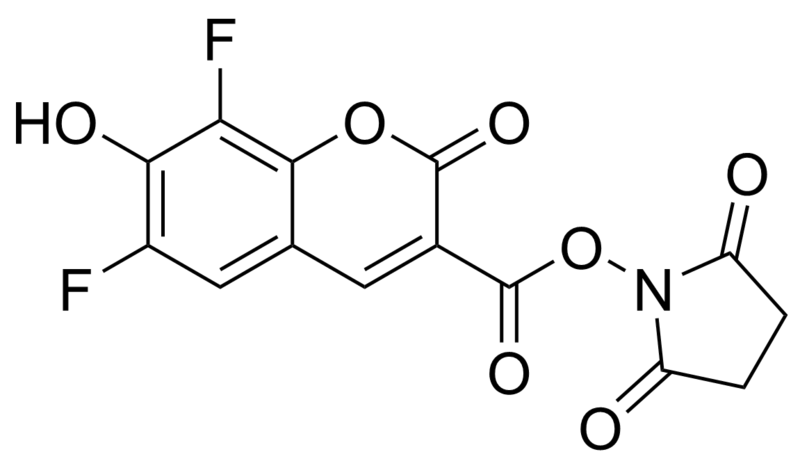 Pacific Blue and Alexa Fluor® Dyes is a registered trademark of Invitrogen, part of Thermo Fisher Scientific. Fluoroprobes is not affiliated with or endorsed by Thermo Fisher Scientific. AFDyes are GENERIC versions of Alexa Fluor® Dyes and ARE NOT manufactures, distributed, or affiliated in any way with Thermo Fisher Scientific.